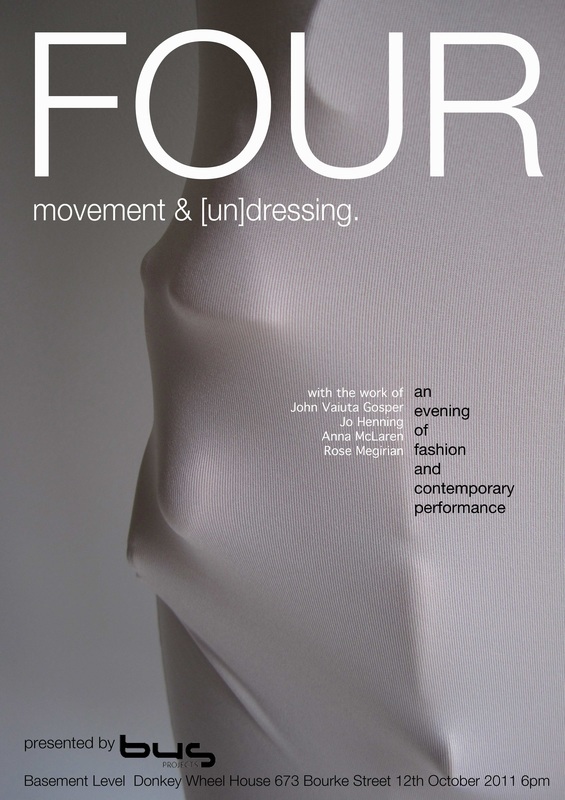 FOUR: movement & [un]dressing from John Gosper on Vimeo. Showcasing final year projects from four graduating university students, FOUR will offer a night of fashion, dress, and clothing presented through contemporary dance and movement schemes. This is a unique opportunity to see innovative approaches to fashion by burgeoning practitioners. The night is a contribution to the idea that movement and motion are integral to the presentation of fashion and dress. Fashion lives in the present moment; it interacts with the body to create a synthesis of sense for both the wearer and the viewer. The relationship between fashion and dance will be explored, using the body as their major commonality. The work of John Gosper, Rose Megirian, Anna McLaren and Joanna Henning will each be presented in divergent approaches and utilising the skills of contemporary dancers who are recent graduates of Victoria College of Art and WAAPA.